Grade 1 winner Voodoo Song, multiple graded stakes winner Irish War Cry and local hero Mr Havercamp headline a list of 20 horses nominated to the Grade 1 $800,000 Ricoh Woodbine Mile, to be held Saturday, September 15, at Woodbine Racetrack in Toronto. The prestigious Ricoh Woodbine Mile, which offers 'Breeders' Cup Win and You're In' status, has drawn nominations from across North America and Europe. Voodoo Song, trained by Linda Rice for owner Barry K. Schwartz, has won eight of 16 career starts and broke through at the top flight last time out with a victory in the Grade 1 Fourstardave, at Saratoga. The four-year-old son of English Channel is one of several New York-breds to rise to prominence of late. “Diversify won the Whitney here and Mind Your Biscuits is a New York-bred as well. 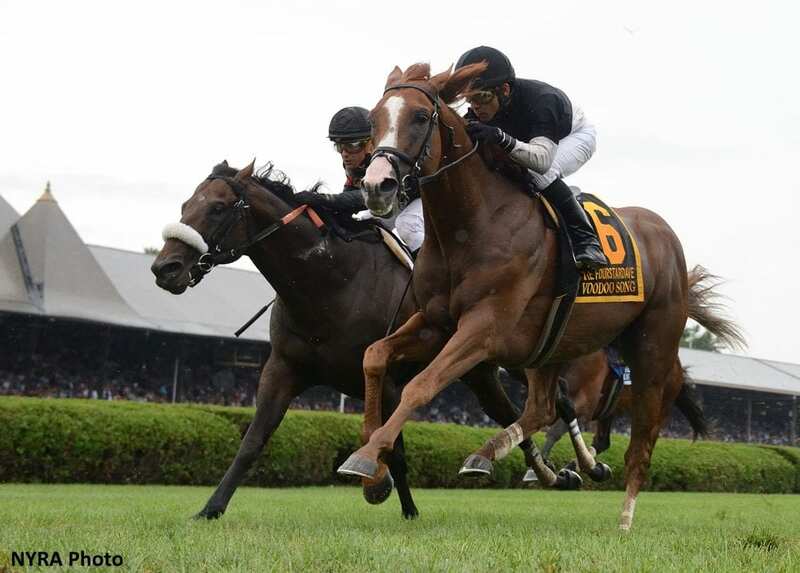 It's been a great year for New York-breds,” said Rice from Saratoga. “I personally claimed and raced Palace, who won two Grade 1 races here at Saratoga. Voodoo Song's Grade 1 breakthrough was a tough front-running performance that saw the chestnut earn a neck victory over fellow Ricoh Woodbine Mile nominated horses Delta Prince and Divisidero. Rice has enjoyed previous success at Woodbine including stakes wins with Quick Blue (2002, Grade 3 Royal North), Torgan (1997, Victoria) and Rosie O'Greta (1995, My Dear). “It's been awhile since I've taken anything to Canada, but I like going any place I win,” laughed Rice. Isabelle de Tomaso's homebred Irish War Cry will make his turf debut in the Ricoh Woodbine Mile for trainer Graham Motion. The four-year-old Curlin chestnut captured the Grade 2 Holy Bull and Grade 2 Wood Memorial as a sophomore and was among the favourites for the Grade 1 Kentucky Derby where he split the field in 10th. Irish War Cry opened his four-year-old account with a score in the Grade 3 Pimlico Special but was vanned off following his most recent outing in the Grade 1 Stephen Foster Handicap, at Churchill Downs. Irish War Cry's half-brother, Irish Strait, captured the grassy Grade 3 Red Bank Stakes at Monmouth Park last year. Motion believes millionaire Irish War Cry has more to show. “He's one of the most talented horses I've trained, but the frustration of dealing with his idiosyncrasies have been confusing to figure out,” said Motion. Sean and Dorothy Fitzhenry's Mr Havercamp will go into the Ricoh Woodbine Mile off a first graded score having captured the Grade 2 Play the King Stakes on August 25 at Woodbine. Trained by Catherine Day Phillips, the Court Vision chestnut is perfect in four attempts over the E.P. Taylor Turf Course including previous turf successes in the Vice Regent and Bunty Lawless Stakes here last year. European raider Lord Glitters will ship to Woodbine from a victory in the Group 3 Strensall Stakes at York, a path that proved successful for winning connections Geoff and Sandra Turnbull and trainer David O'Meara with Mondialiste in the 2015 Ricoh Woodbine Mile. Trainer David Simcock will saddle the well-traveled Arod for a third attempt at the Woodbine Mile having finished fifth in both the 2016 and 2017 runnings. A full list of nominated horses is available below. The lucrative Saturday, September 15 card also features the Grade 1 $300,000 Northern Dancer Stakes, the Grade 2 $250,000 Canadian Stakes and the Grade 3 $125,000 Bold Venture Stakes. In addition, the Sunday, September 16 card at Woodbine includes two 'Breeders' Cup Win and You're In' races for two-year-olds highlighted by the Grade 1 $250,000 Natalma Stakes for fillies and the Grade 1 $250,000 Summer Stakes, both to be contested at one mile on the grass. Last year, World Approval captured the Ricoh Woodbine Mile en route to a famous score in the Grade 1 Breeders' Cup Mile, which helped the Mark Casse-trained grey secure Eclipse Award honours as Champion Turf Male. The 2018 edition of the Mile will be televised live on TSN2. Thirty-seven two-year-old fillies have been nominated to the Natalma Stakes (Gr. 1) and an additional 34 juveniles have been nominated to the Summer Stakes (Gr. 1). For a full listing of nominees for the September 15/16 Breeders' Cup 'Win and You're In' weekend, complete with past performances, click Woodbine's Thoroughbred resources page. This entry was posted in Breeders' Cup and tagged barry schwartz, Breeders' Cup, catherine day phillips, david simcock, Graham Motion, irish war cry, Linda Rice, mr havercamp, ricoh woodbine mile, voodoo song, win and you're in, woodbine, Woodbine Mile by Woodbine Communications Office. Bookmark the permalink.